One of the nicest problems to have is being presented with too much choice for your maid of honour, but it’s also the toughest to crack. 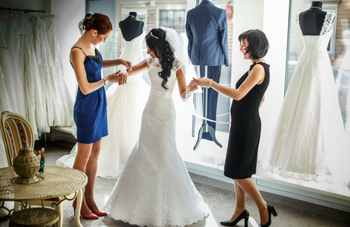 As well as the obvious issue of trying not to hurt anyone’s feelings, your maid of honour needs to besomeone you can lean on in the busy wedding period of your life. This girl needs to be organised, know you from head to toe and care about the little details that will make your hen do and big day truly special. When you strip back all the respon­sibi­lities of a maid of honour, the most important thing you need to think about is who you want by your side. Through the hard parts and the easy parts, through the tears and the laughs – this is the upmost important thing to remember. Forget about hurting people’s feeling when it comes to this, it’s your big day! Okay so now all the soppy stuff is out of the way, it’s time to talk business. Your bestest friend since birth might be an obvious choice, but if she’s so unorganised that she struggles to find her own shoes in the morning this may not be the task for her. Plus, if she’s your best mate she’ll totally understand that it’s all about choosing a maid of honour who will do the best job for you and your fiancé. Think about your friends, sisters, sister in laws or even your mum who’s just as passionate about your soon-to-be marriage as you are – that is a big bonus!With passion, comes a lot of time and effort put into every aspect of your big day to make it perfect. From the table settings, to the hen party activities, to the flowers in your hair, it all matters to someone who is really enthusiastic about you getting hitched. Last but by no means least, choosing a maid of honour means picking someone who knows you like your sisters (even if you actually are sisters). This comes into all of the above elements to think about, as it effects everything. From the little things to the big stuff, if your maid of honour doesn’t know you like the back of her hand you’re bound to be disappointed. For example, what if you hate anything outdoor and she kindly organises you an adrenaline fuelled weekend in the Lake District? Nightmare!